The Rental Property Management Licensing Course is administered on behalf of the Real Estate Council of British Columbia (RECBC). The course provides the licensing education requirements for those who wish to become licensed property managers in British Columbia. This course combines the general components of the Real Estate Trading Services Licensing Course with curriculum focused on property management. For detailed course content information, please view the Table of Contents and Course Regulations. 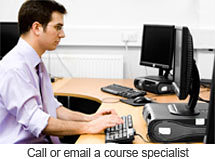 This blended learning course allows you to register at any time. While the course is flexible in order to meet the needs of busy adult learners, it provides just enough structure to ensure high quality learning (for example, in order to provide for a minimum level of familiarity with the curriculum and for a reasonable expectation of success on the final examination, assignments may be submitted on a pace that is no greater than 2 assignments per week beginning on the Course Registration Date). You must complete all course assignments within one year of registration in the course and also pass a final examination. Regularly scheduled exams take place at various times throughout the year throughout the province (exams must be written in Canada) and your first registration is included with the course tuition fee. You may also choose to take your exam at the computerized exam centre (CEC) at UBC for an additional fee. Completing the Rental Property Management Licensing Course satisfies the licensing educational qualification in British Columbia for a licence to provide rental property management services. In order to open your own property management company, you will be required to either satisfy the requirements for a brokerage licence, or hire a managing broker for your company. For information on these requirements, please contact the contact the Real Estate Council of British Columbia at (604) 683-9664 or toll-free at 1-877-683-9664. The Real Estate Trading Services Licensing Examination, Rental Property Management Licensing Examination, Strata Management Licensing Examination and Mortgage Brokerage in British Columbia Examination will be three hours in length and contain 100 questions in a multiple choice format, each worth one mark. All supplemental examinations will be two hours in length and contain 60 questions in a multiple choice format. Inter-provincial examinations will be two hours in length with 50 questions in multiple choice format. The Broker's Business Planning and Financial Management Licensing Examination will be three hours in length and contain both multiple choice and written questions that are generally short-answer or "essay-style". Note that an "essay-style" question does not require you to write an essay! In general, a short paragraph will suffice. In most questions, point form answers are perfectly acceptable. I would like to renew my representative's licence. What do I do? All candidates who are seeking to renew their licence should contact the Real Estate Council of British Columbia. The Rental Property Management Supplemental Course is available to those licensees who are currently licensed, eligible to be licensed, or who have written a full licensing exam within the last year and wish to become licensed to provide additional real estate services. The Course Schedule gives you an indication of the topics and lessons included. DO NOT download the challenge exam registration form if you are currently registered in the Rental Property Management Licensing Course. Inter-provincial candidates (those wishing to transfer their licence from another province/territory to British Columbia) should visit the Real Estate Council of BC's Jurisdiction webpage for information. WHAT'S INCLUDED: Your tuition fee includes all of the appropriate course materials (e.g., manual, workbook, and handbook - usually dispatched via courier within three to five business days of registration), access to tutorial services, and your first examination registration provided it is on a regularly scheduled examination date.